Speaking of how time flies, can you believe it's almost Christmas again? Wow - I don't know about you but it sure snuck up on me. With the arrival of the season come the usual traditions. Putting up the Christmas village, trimming the tree, making a list and checking it twice, and shopping the day after Thanksgiving just to name a few. As you write down names with that big blank spot next to it, here are a couple of ideas for your favorite gardening friends and relatives. Here's my disclaimer - I have no affiliation with any of the companies I mention nor have I necessarily tried their products. I just think there some great ideas out there that I bring to you for your reading pleasure. Ergonomic tools: Fist Grip Tools. These tools are lighter in weight so easier to carry around, and made of stainless steel so they don't rust. The tools are available in long reach and add-ons and, the best thing as far as I'm concerned, is that they have yellow handles. I don't know about you but I have a habit of putting my hand tools down and then can't find them for the pile of weeds or clippings. Garden kneeling pads: When I start pulling weeds I have to be up close and personal. That's where kneeling pads sure come in handy. Salamander Graphix makes some really interesting pads, not the usual red styrefomey type. You can get a huge colorful sunflower or a daisy or even a gorgeous purple butterfly. The Chiller Bandana: What a great idea when it's hot and sweaty outside. The premise is that the bandana is soaked in cool water and will keep it's wearer much more comfortable for several hours. It can be reused and just needs to be rinsed out periodically with a mild soap and water mix. Moisture Meter: Want to find out if your plants are thirsty? Use a moisture meter. This one is electronic, can be used for both indoor and outdoor plants, and comes with a plant guide. Christmas plants: If you're not sure what to get, there are always the usual Christmas plants - Poinsettia, Christmas cactus, Amaryllis and Tulips. And here's a little known tidbit of information. 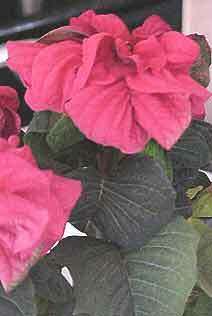 December 12 is National Poinsettia Day . The date marks the death of Joel Roberts Poinsett, who is credited with introducing the native Mexican plant to the United States. Oh, by the way. That Christmas village tradition I mentioned above? I think it's a holiday virus spread by looking at village houses and figurines. My husband and I were immune for several years until we came in contact with my sister during the holiday season. After purchasing many little doodads for OUR village, our only hope is that we can spread the bug to someone else before it overtakes our whole house! Happy Gardening. Hello my dear internet friends! I have some very exiting news. A lot of you know me pretty well now and have helped me a lot. I sincerely appreciate you and I want to do the same for you. Please take a moment to check out this excellent opportunity. I am so very proud to be a part of this business, I just don't have the space I need here to fully express my gratitude and I know you will feel the same way I do. You can even try it out at no charge. Take some time to explore and learn what could be one of the most significant aspects in your life. You will not be wasting your time and I will be honored for you to be my guest. You will love this... Please give me a chance to prove it to you. Click here: money making internet business tool It elegantly covers money making internet business tool related ideas and FREE information. Sincerely, Scott. To find out more visit: make a living online site. It successfully exposes FREE information covering traffic and make a living online related stuff. Don't forget, FREE, FREE, FREE!! !